This morning I made 24 slices of French toast, so the kids ate a couple pieces each of that, as well as some grapes and bananas. (See, they do eat fruit…sometimes.) The leftover French toast is now in the fridge and will likely be used for some Yo-Yo meals over the next couple days. For lunch Jerah made macaroni and cheese for herself and Joely. Not being hungry by lunchtime, Jaden didn't eat anything, but he obviously saved his appetite for eating tons at dinner. As for me, I had French toast for breakfast and a bowl of wheat cereal for lunch. Jeff doesn't usually eat breakfast, so he just had coffee before heading to work this morning. He came home for lunch today and ate the last of the hot dogs, so at least you won't be seeing hot dogs as our Yo-Yo meals for at least another two weeks. 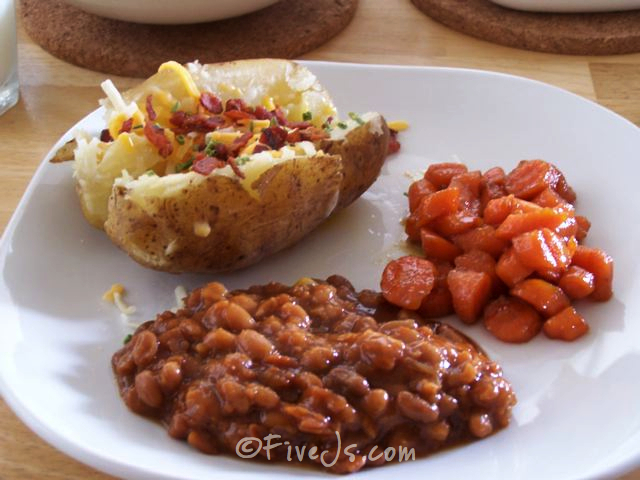 I managed to make dinner tonight—baked potatoes, glazed carrots, and baked beans—and the whole family ate dinner together, although Joely only picked at hers. This is my dinner plate, by the way. Since I hadn't made baked potatoes for the family before, I figured the girls might be a little hesitant to eat them; so I had them help me prepare the potatoes, thinking that if they helped make them, they might be more likely to eat them. It worked with Jerah at least. I also made homemade bacon bits—a first for me. They were really delicious with the baked potatoes, so I'll definitely be making those again. One helpful tip I discovered on the internet before making the bacon bits was to freeze the bacon for at least 30 minutes before cutting it so that the bacon is easier to dice; and it definitely made a difference. As for the glazed carrots, I really liked them…but no one else seemed to. That means I won't be making carrots that way again—at least not for the whole family. Tomorrow's dinner is meatloaf and it's already in the freezer. This will be the first time I actually make a meal that I prepared ahead of time and froze, so we shall see if it works for me. Make sure you visit Kate's and Toni's kitchens to see what they've got cookin' for our 3 Moms, 3 Kitchens, 31 Days adventure! In a medium saucepan, combine the kidney beans, salt, chili powder and pepper. Cook over medium heat until heated through. To assemble the haystacks put a hand full of corn chips on a plate, follow with a spoonful of heated bean mixture, lettuce, tomato, green pepper, onions, olives, carrot, and cheddar cheese. Top with salsa and sour cream. Place potatoes and garlic in a large saucepan; cover with water. Bring to a boil over medium-high heat. Cook for 15-20 minutes or until tender; drain. Place potatoes and garlic in a large mixing bowl. Add the remaining ingredients; mash. Bring a large pot of lightly salted water to a boil over high heat. Add the rigatoni pasta, and cook until al dente, 8 to 10 minutes; drain and keep warm. Heat the olive oil in a large skillet over medium-high heat. Season the chicken with salt and pepper, and cook in the hot oil until lightly browned on all sides, and no longer pink in the center, about 7 minutes. Remove the chicken from the pan, and keep warm. Stir the onion, garlic, and peppers. Cook and stir until the onion has softened, about 4 minutes. Add the roasted red peppers, hot cherry peppers, and crushed tomatoes. Bring to a simmer, then stir in the heavy cream and cooked chicken. Simmer 2 or 3 minutes, then stir in the pasta. Sprinkle with Parmesan cheese to serve. Heat 1 tablespoon of oil in a large skillet over medium-high heat. Add green onions and mushrooms, and fry until tender, stirring frequently. Combine the garbanzo beans (with liquid) and garlic in the container of a blender or food processor. Blend until smooth, and transfer to a medium bowl. Stir in the mushrooms and onions. Mix in the cilantro, parsley, curry powder and cumin. Add the bread crumbs and egg whites, and mix until thoroughly blended. You can let the mixture sit in the refrigerator to blend flavors at this point, or go on to frying. Heat enough oil to cover the bottom of a large skillet over medium heat. Form the bean mixture into 4 balls, and flatten into patties. Place the burgers in the hot skillet, and fry for about 5 minutes on each side, until nicely browned.